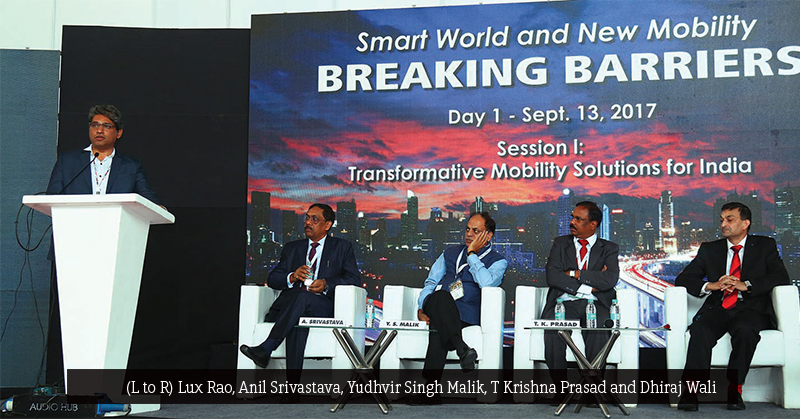 The inaugural session of the Conference on ‘Smart World & New Mobility: Breaking Barriers’ started with discussion on ‘Digital Innovations for Mobility’. The panel discussion on the first day of the Conference under the session ‘Smart Mobility in Urban Cities’ gave an insight into the government’s planning through Yudhvir Singh Malik, Secretary, MoRTH and Anil Srivastava, Adviser (Infrastructure Connectivity), NITI AAYOG. It also threw light on the opinion of the enforcement agencies that execute the policies through T Krishna Prasad, DGP – Railways & Road Safety, Telangana State. The industry’s foresight was given through Dhiraj Wali, Vice President, Robert Bosch Engineering and Business Solutions Private Limited and Lux Rao, Director & Leader, Digital Transformation Office, Cisco India & SAARC, who also moderated. Opening the session, Lux Rao said, “The impact of technology on equalising the social fabric has never been felt as it has been felt now. 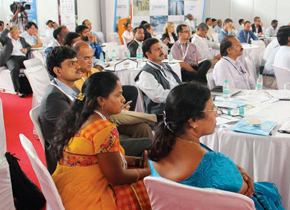 The grand vision for 100 Smart Cities that has been unveiled by the Prime Minister could not have been timelier. One of the biggest problems today is urbanisation as it is happening in India where more than half of the population is milling around the cities, just like the worldwide phenomenon where of a population of seven billion, more than four billion reside in cities. The land mass, however, is only about one-seventh of the total landmass which means the Smart Cities must be really smart in all of the resources”. Emphasising that ‘Smart Mobility in Urban Cities’ was a very important and relevant topic, he said that a clear need was felt for mobility as it is a very important parameter on which a citizen assesses the government’s performance. “Partly because of prosperity and partly because of the unplanned growth, the cities are reeling under pressure. So what could be the plausible solutions to address these problems of Urban Mobility?” he asked. Rao also emphasised the need for public-private innovation and participation. “User-centric mobility is all about the aggregation element; integrated and intelligent transportation; automation and safety because we are living in a very connected world; and integration of the sensors and telematics in our framework of transportation”, said Rao. He asked the MoRTH Secretary if integrated and intelligent transportation system or ITMS’ roll out would actually solve a lot of problems. Malik said that 200 electric vehicles/ taxis by Mahindra Group running in Nagpur for about six months on economic running cost were an inspiration. “I will not black out India in terms of electric vehicle altogether because we have heard of Reva many years back (taken over by Mahindra),” he said. “Sufficient arrangements have been made for the charging of these vehicles”. Driving home an important point that infrastructure was very important for technology to be effective, Malik said, “When it comes to Smart Mobility, several IT companies came to us with solutions. But for any smart city, the first point is the infrastructure solution. IT only helps to optimise the infrastructure utility. So, 80 per cent of the solution or problem lies in creation of infrastructure, IT rides on it to give optimal utilisation. In the IT sector, you have algorithms worked out, and a complete road network of an urban area is put into the system: Which area has to be served by the Metro? Which area has to be connected with the Metro and the bus system? Which area in the bus-system at the last mile needs to be connected with the e-rickshaws? That is how it has to be planned and end-to-end solution needs to be put in place”. He mentioned the rechargeable cards as a unique example of integration of the system. Based on a discussion with London Transport, he said, the cards can be topped up and used for all transport modes. He said, “In our cities like Delhi, particularly in the older areas, the biggest challenge is for the pedestrian who finds it difficult to move freely because nobody constructed houses with parking of three-four cars. Ultimately, these cars are parked on the roads. Though we cannot stop a person or an aspirant from buying a car, as long as we provide the public a transport system which is efficient with last mile connectivity, his intensity to take the car out on every occasion will go down”. “Though we cannot stop a person or an aspirant from buying a car, as long as we provide the public a transport system which is efficient with last mile connectivity, his intensity to take the car out on every occasion will go down”.